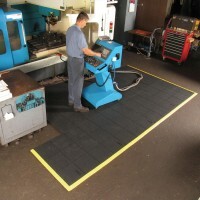 Multi-purpose Interlocking and linkable mats & tiles are designed for covering large or custom shape areas. Safety and anti-fatigue properties. Available with or without color stripes. 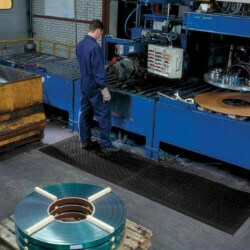 Linkable mats solid tiles are designed for use in dry worker areas where safety, comfort and protection is required. 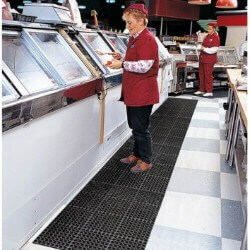 Our linkable drain-thru matting is designed with drainage holes to allow liquids to pass through. 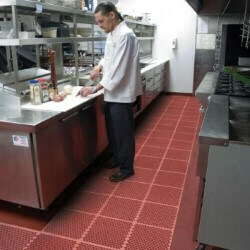 Tek-ToughÂ® is an all purpose 7/8" thick anti-fatigue mat providing superior comfort and traction in wet and greasy areas, perfect for the food industry. 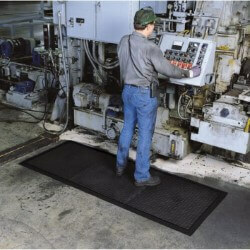 The large hole drainage system facilitates the removal of liquids and debris. The modular design and optional ramps, allows for custom configuration.